After being told by her beloved grandmother confesses an extraordinarily family secret, Iona Sheehan leaves her life in Baltimore to travel to Ireland. There she is excited to meet her cousin, Connor and Branna O’Dwyer, for the first time. In County Mayo she lands a job at a riding school and feels that perhaps she is home for the first time. What Iona doesn’t know is that Connor and Branna have been expecting her for a long time as the three cousins have inherited a dangerous gift that will transform their lives. 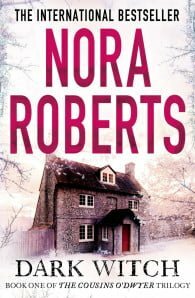 Nora Roberts is back with Dark Witch, the first in a magical new trilogy tells the captivating story of cousins Iona, Connor and Branna.